In honor of all the charming redheaded Irish boys named Patrick, and old boyfriends who always wanted me to quit the henna habit and revert to dirty blond, here's my latest recipe for red hair. It's easy, slimy-fun, and very effective. So effective, in fact, that just yesterday I had to listen to somebody extol at great length the beauty and rarity of my natural red hair. He even explained how redheadedness was a recessive gene, which meant that both my mother and father must have redheads in their family. How embarrassing! My red hair is a white lie, and inspires patronizing lectures! I panicked this morning when I found myself in the middle of the St. Patrick's Day parade. Assessment: Look at your hair. Is it lightish-colored and porous? Very strong, smooth hair will not absorb the henna as well as weak wavy hair. And of course, dark hair won't show the effects much at all, while blond hair will turn orange. Unlike gnarly ammonia-based hair dye, henna does not bleach your hair, and can only add color -- which it does by bonding with the weak spots in your hair. Regardless of color and texture, henna will strengthen and condition your hair. Selection: Procure the finest, freshest henna you can find. I do not recommend the expensive brands in health food stores. Instead, pick up a box for $2.50 at the local "India Bazar" or one of those markets where you can also stock up on Turkish delight, fresh dates, and halvah. Choose 100% pure henna -- sometimes chemicals, indigo, or ayurvedic herbs are added. It should be very finely powdered and smell faintly grassy. Preparation: Empty two cups henna powder into a ceramic bowl. Add a tablespoon each of paprika, cinnamon, and other interesting spices. Bring 3 or more cups water to a boil and add two bags of black tea and two tablespoons of hibiscus flowers. Allow it to steep for a good twenty minutes. Return to a boil, strain, and stir into the henna a bit at a time. Add enough to achieve a smooth, almost soupy texture. It will thicken as it cools. Cover the henna pot and let it macerate for several hours. Take care to keep it off your skin. Curing: remove your glove, and carefully pull the plastic bag up on your head. It should fit perfectly around your hairline. Gather the top of it together around your hair, tuck, and tie an old towel or scarf around it to keep everything in place. Heat and moisture are key for the next two hours. Clean up all henna spatters, do laundry, read, or watch a movie. You'll probably look funny, especially if the henna was too liquid and seeps out from under your turban like gangrenous algal ooze. Let it cure for two hours or more. Removal: You don't want all that grime going down the drain. I've stood in a dank basement with moldy old henna dripping all round me, sawing into old lead pipes and scraping out the slime with my fingernails. Instead, hose your hair outside, or rinse it into a bucket or garbage bag and empty it down the toilet. 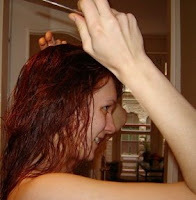 It's a matter of debate whether shampooing your hair immediately after a henna job will lighten the colors. I like the grassy smell, frankly. It's like the hay mow. dude, so trying the added spices!